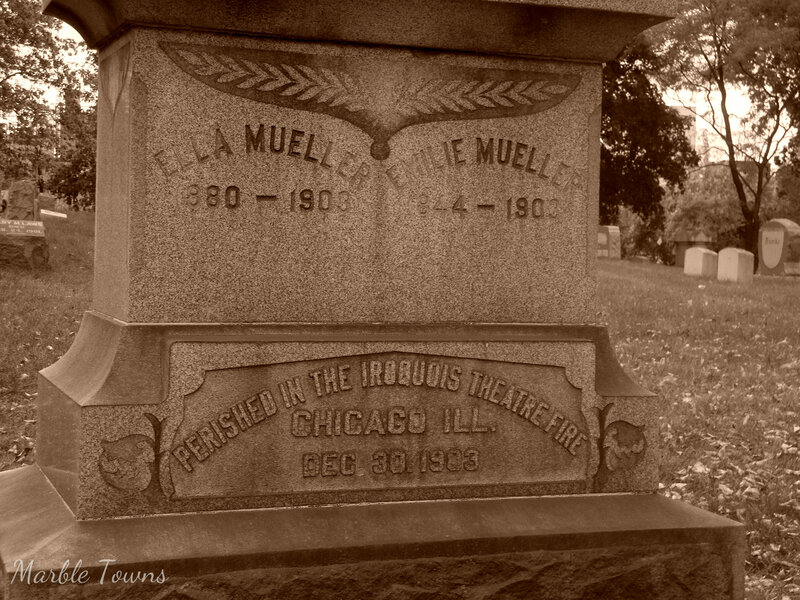 Today is the anniversary of the Iroquois Theater Fire that happened in Chicago on December 30, 1903. It was the deadliest theater fire in history, killing more than 600 people when all was said and done. It was during a matinee performance of Mr. Bluebeard when the fire broke out backstage and then quickly spread. 27 of the theater’s 30 fire exits were locked, and there was no fire safety plan at the time. The exits inside the theater were also not clearly marked, so in the panic, people didn’t know where to go to escape. This marker is in the Forest Home Cemetery in Milwaukee, Wisconsin. This mother and daughter attended the performance on December 30, 1903 and perished in the fire. As a result of this tragedy, safety rules were dramatically changed, not just in Chicago, but in the entire United States. After this, all theater exits had to be clearly marked and doors rigged so that in the event of an emergency, that they could be pushed open from the inside. You can read more about the Iroquois Theater Fire on History.Com, this article in the Chicago Tribune, and on the page at the Eastland Memorial Society (and loads of other sources). There’s also a very good book about it called Chicago Death Trap by Nat Brandt. Kletszch memorial, Forest Home Cemetery, Milwaukee, Wisconsin. This will be my last post until the end of the holidays — so have a very Merry Christmas, everyone! taken in Maine, 2008. Sorry, I don’t have the cemetery information — it may be Tolman Cemetery in Knox County. Yes, sorry ….. last week, I didn’t post a Tragics post. Tolman Cemetery, Maine —- 2008. Oddly enough, while I can find a record of a different Benjamin Brewster, I can’t find anything about this man, although there are other Brewsters in this cemetery. Powered by Linky Tools — which will put in the links, in a new tab. Taken in the Tolman Cemetery, Knox County, Maine. My first trip to Maine, I took photos with a regular, film-using camera, but by the second trip, I had a digital camera, and was starting to get more serious about my cemetery photography. This stone caught my eye for the unusual name of Samuel’s wife.